Whether you enroll your child in a summer camp in Vernon Hills with our team or you book our obstacle course for your kid’s birthday party, the goal of our team at Hot Ground Gym® is to help build your child’s confidence and courage through unique physical fitness challenges and guided obstacle courses. Through a series of activities, we work with children to develop their strength, stamina, and communication skills. Our unique approach implements physical, mental, and character building activities to focus on the full development of your child. Contact us today to learn more about how our program works or to schedule in Vernon Hills, Northbrook, or Arlington Heights. Why choose Hot Ground Gym® for your child? When your children visit Hot Ground Gym®, they will be introduced to far more than just a simple fitness routine. Rather, they will be exposed to real-life leaders who demonstrate how they can build confidence as they grow physically and mentally stronger. 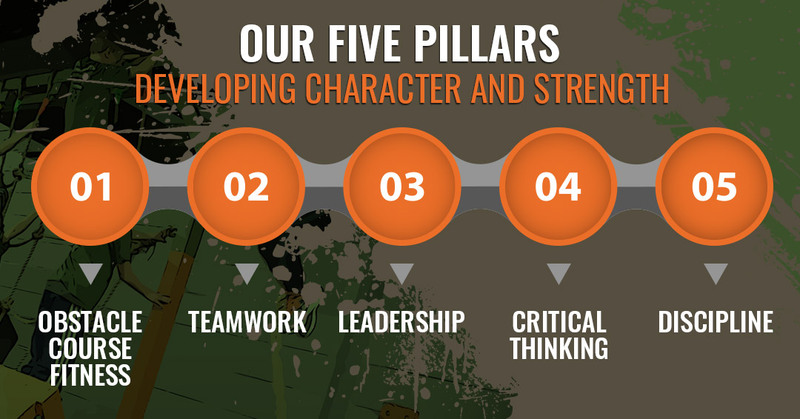 By implementing the five pillars of our foundational program, we effectively guide children to a stronger place throughout their time with us. Find out more information below about each of the unique programs we offer and feel free to reach out any time to learn more about Hot Ground Gym®. With locations in Vernon Hills, Northbrook, and Arlington Heights, we are here to serve the greater Chicagoland area. Too often kids camps miss the mark in regards to the full development of your child. In many cases, their days are simply filled with random activities, aimed at passing the day. Our summer camps and winter camps are a different breed. We didn’t simply put together a camp program that passes the time, we designed a focused set of challenges that will help strengthen your child physically and mentally. We will work toward building character and leadership skills as your child attends our camp. We offer winter and summer camps in Vernon Hills, Arlington Heights, and Northbrook. During our camps, your child will be exposed to an array of skills, experiences, scenarios, and challenges. The goal is that, by the end of every single day, your child will head home stronger physically and mentally. Through our guided obstacle courses and teamwork, your child will learn how to think critically, how to depend on teammates, and how to become a more confident person. If you are interested in our winter or summer camps, reach out to learn more about enrollment. Don’t settle for any old birthday party for your kid. If you are looking for birthday party ideas in Vernon Hills, Arlington Heights, or Northbrook, we have the solution for you. Rather than simply baking a cake and hanging streamers, booking a birthday party with Hot Ground Gym® will provide your child with an event that is memorable and meaningful. When you book a birthday party with us, the event will be 100 percent private. Our entire staff and facility will be dedicated to your child’s special day. The party will begin with 60 minutes of guided activity. This is the portion of the party where your child will participate in obstacle courses and team building activities. Once the mission has been completed, the next 30 minutes are for eating food and cake, if desired. We never charge extra for you to bring your own food and cake to the party. In fact, we will even have your birthday child cut the cake with a military sword! If you want to book a birthday party that will be unforgettable, contact us to learn more. If you are looking for a unique program to enroll your kids in that will help them develop better discipline, physical strength, and mental fortitude, then Junior Boots™ is the perfect fit. This program is great for children between K and 8th grade. Each age group will participate in focused activities that help to develop problem-solving capabilities, discipline, and fitness. One highlight of our program is our obstacle course for kids. This course implements physical activity in a creative and fun way. Using military-style obstacles paired with weekly themes, your child will exercise and play in a structured manner that is designed to develop them both physically and mentally. Check out our kids’ gym schedule here and reach out to learn more about our program. Have an event that you think our program would pair well with? We offer our services on the go. 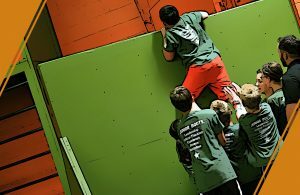 We will travel to your event, set up a unique obstacle course, and run guided physical activities. Whether you are planning a fundraiser, a school event, or just a party involving kids, our unique approach to fun and fitness will be a great choice. Reach out to talk to us about your particular event needs. From our summer camps in Vernon Hills to our weekly Junior Boots™ in Arlington Heights, we offer far more than a traditional kids’ gym. We provide a place for your child to grow. To develop skills that will last them for life. If you want to instill discipline, leadership, and fitness in your child’s life, we invite you to give our program a try. Reach out today.